By popular demand, we have added a second Women’s Ski Camp in March. These camps sell out fast and we typically have waiting lists. When we realized we had some much interest and the lodging capacity, we put together another ski camp for intermediate to advanced level skier March 13-17. Last week was a mixture of sunshine and new snow. The big sleeper storm was on Thursday evening when the forecast calling for 3-5 inches of snow turned into 11 inches! 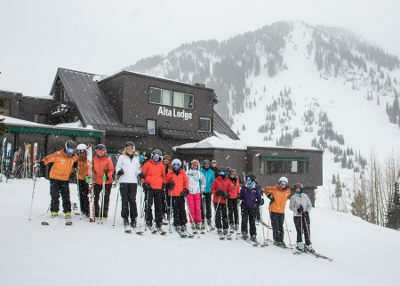 Before the snow settled, Alta had a 100-inch base. Coupled with three consecutive days of sunshine, the skiing conditions were great.